Wishing to keep the Q Park https://jandeane81.com/showthread.ph...!!! !-Park-Here thread alive and well for members and visitors, so those not interested in Q material but needing to understand or debate or those wishing to talk about material have somewhere to do so, here. I think the resignation of Sessions was a huge blow to Q credibility, as Q oft repeated Trust Sessions. Sometimes God shines his magic light beam from outer space, and it works in mysterious ways. Nah, those of faith in general have the extraordinary ability of performing amazing feats of mental gymnastics in order to keep their love affair with said narrative alive and well. It could be construed as this simply being yet another demonstration of 5D chess mastery by the bad orange man, with the focus on Sessions being a much needed misdirect. 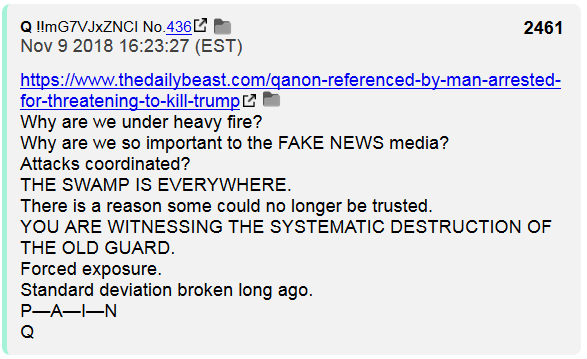 Yes, Q has also said, "Trust the plan." 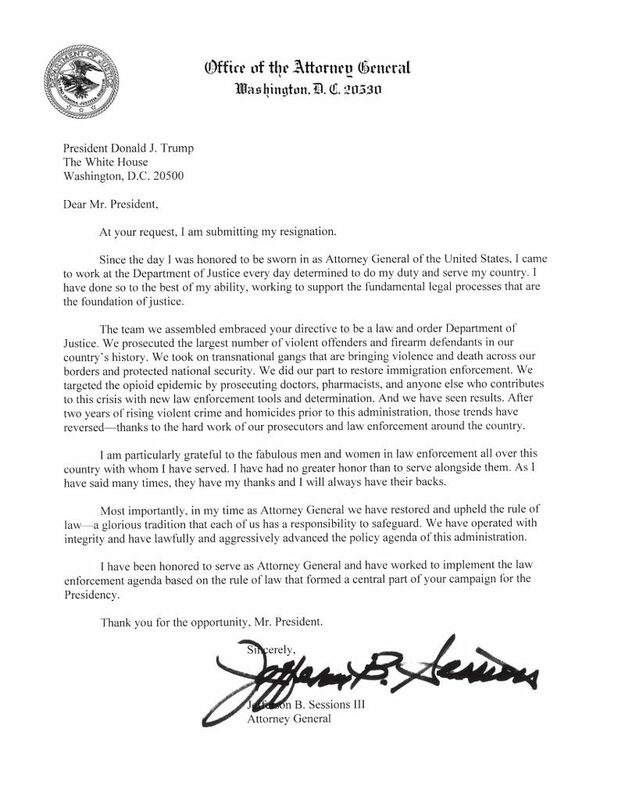 Notice that Sessions' resignation letter does not have a date. This may very well mean that the letter had been prepared well in advance of his actual resignation taking place. Jeff Sessions has fulfilled his role. Time to move into another phase of 'The Plan'. Q has also made it clear that 'dis-information' is necessary. They are not going to be telling their enemies what will be taking place. The 4chan & 8chan boards have been under constant attack for some time, now. 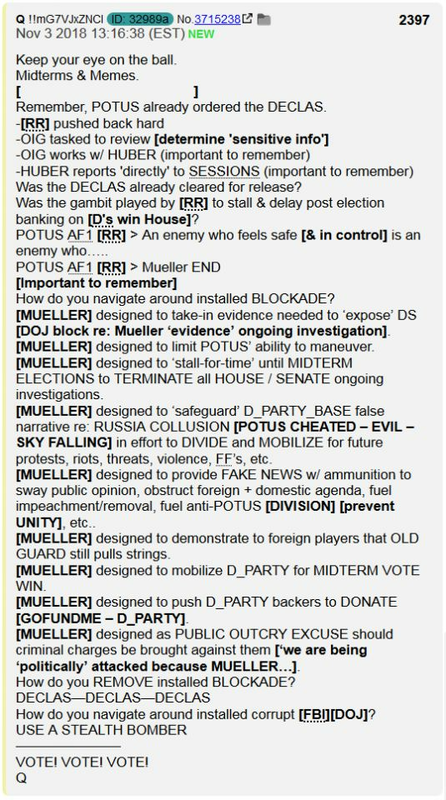 The minions of the Deep State are also on the 4/8chan boards viewing what is being posted. 'Deception' is a tool of warfare described in Sun Tzu's book, The Art of War. As Trump & the patriots in office are up against the Deep State. 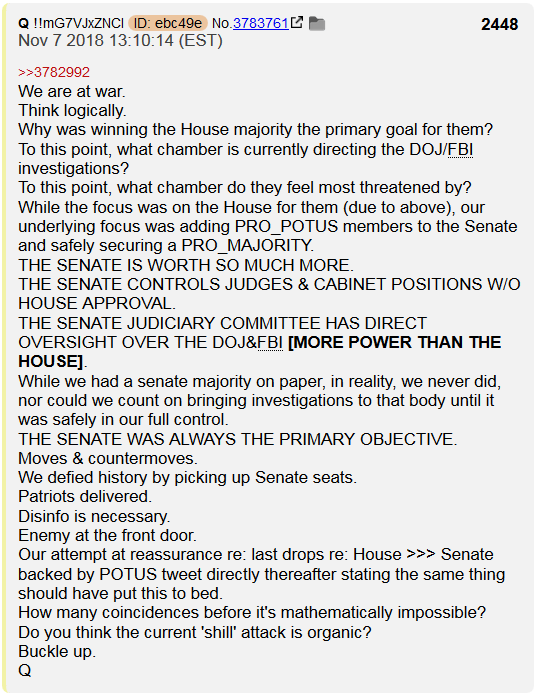 Q reminds us that this is a war. Many believed that Jeff Sessions was that 'Stealth Bomber', working behind the scenes - undetected. As it turns out, it appears that Matt Whitaker is more likely to be that 'Stealth Bomber' that was referenced in the Q posts. Jeff Sessions had done his job, has now stepped aside, so that perhaps Matt Whitaker can do the 'heavy lifting'. Last edited by turiya, 11th December 2018 at 14:17. Note: Sessions 'resigned' so that [RR] would not be elevated to replace him. Sessions 'resigned' at the request of POTUS so that Trump could then select his replacement. Attorney General Jeff Sessions resigned on Nov. 7, at President Donald Trump’s request, and was replaced on an acting basis by Matthew G. Whitaker, who had been Sessions’ chief of staff. 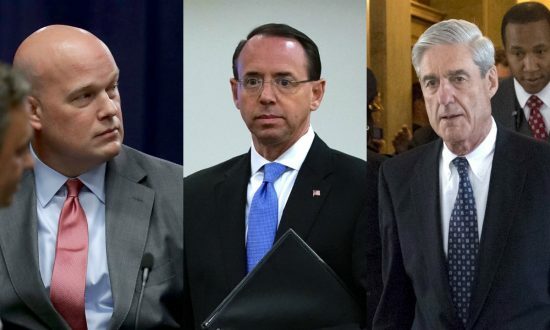 Deputy Attorney General Rod Rosenstein, however, remained in his current position. Sessions technically wasn’t fired. He resigned at the president’s request in an undated letter. Sec. 3.Revocation of Executive Order. Executive Order 13775 of February 9, 2017, is revoked. (2) subject to subsection (b), once a first or second nomination for the office is submitted to the Senate, from the date of such nomination for the period that the nomination is pending in the Senate. (b) (1) If the first nomination for the office is rejected by the Senate, withdrawn, or returned to the President by the Senate, the person may continue to serve as the acting officer for no more than 210 days after the date of such rejection, withdrawal, or return. (B) for no more than 210 days after the second nomination is rejected, withdrawn, or returned. Trump’s executive order was a last-minute reversal of an executive order issued by President Barack Obama on Jan. 13, 2017, that altered the line of succession within the DOJ. Obama’s action wasn’t done in consultation with the incoming Trump administration. The president clearly needed an attorney general who isn’t hindered by recusal issues. Rosenstein would have been an unlikely choice precisely because of his prior involvement with all things Mueller. Last edited by turiya, 14th November 2018 at 00:56. Last edited by turiya, 14th November 2018 at 16:16. Okey dokey, feeling Jan and Feb will be great moonths, exlent even, in regards to happiness ( yes noospheric diving is still potentials felt n displayed ) and suffering release. Due to this and a wee feeling around painful data being released asap to the general public in differing ways, Q n others will/may over power the narrative, see also a transmutation karma wise regarding past truth humanity wise, huge transmutation actualllly. Because the % happiness wise is big early next year. N growing bigger, joy joy joy in 2019, now where did I put those rosey glasses lol. Lets talk, lets be mindless n explore, lets be. I will start by saying that indirectly I feel attacked. Maybe because I usually choose to ignore fear But only when I know n feel my fear can I then reflect, be, allow n change if able, otherwise I will simply acknowledge I have attacked inwardly and outwardly up till now and what may I do to redress or undress the past to address the death of not now known as yet but moding to fear known and hugged. I do think it is unfair that your thread was closed down due to the bad behaviour of others. I don't follow the Q phenomenon at all and have zero interest in it, but I feel you're probably right to be annoyed by this. You should discuss this with the mods privately though. As for the Invasion thread, I'm happy to see it go, it was pure hate-filled rhetoric as far as I'm concerned, even the title of the thread is a dead giveaway that you're going to get biased far-right information and nothing else. I applaud the mods for closing it down. I was actually on the verge of requesting that it be closed myself after seeing that attack on Kathy. The whole topic is pure poison as far as I'm concerned and apparently cannot be discussed in a civilised manner. As someone who has been an immigrant to four different countries on two continents, I also take issue with the whole idea that moving to another country automatically makes you a bad person and a borderline criminal or even an "invader" which of course implies that the use of deadly force would be thoroughly justified against you. This very concept disgusts me to my core. That doesn't mean that we should open up our borders and just let everyone stream in, but a measure of compassion and humane treatment should be the default position, especially when it comes to children and their families. I find this basic humanity and compassion sorely lacking in the US government's (and Hungary's) approach to what are basically desperate, highly vulnerable people fleeing a bad situation. Granted, they mostly just want to migrate for economic reasons and are often taking advantage of outdated refugee procedures, but you really can't blame them for wanting a better life for themselves. The macro micro demaned it be shut down, even this forum works strongly with the energy/ies of its members known and not known, within one. I have tried to explain to Steven & others previously that I am not here for a battle to rage between thesis & antithesis. No, not here to do battle with anybody, really. Rather, here for a synthesis between the two. It should be quite easy to understand that putting out a fire with more fire just simply can not work. It makes no sense to even try. For a fireman it is simple common knowledge. If we are to really become ONE then a bridge need be constructed. How to build a bridge? A bridge is not built in a day. It takes time to understand. It takes time to explain. It takes time for storm clouds to dissipate. Time for a storm to run its course. The blue sky is always there. It only appears not to be there when a storm of thoughts cloud One's inner sky. When mind moves, divisions can be created. No mind.... then, clearly we are ONE. No time is needed to see that this is indeed the case. Misunderstandings are plentifully available during stormy weather. Understanding is more available when inner sky is accessible. When clouds have gone on their way. In fact, we were never really separate. So, no bridge is really needed. There is really no distance between the two. There are really no 'two'. When we are ONE, Existence rejoices. Existence rejoices regardless of the cloudy thought storms that come & go. Connect with Existence. And feel the joy. And, Peace be here & now. This moment. Last edited by turiya, 11th December 2018 at 20:01. Addiction to the storm is also celebrated n envied by the bored to busy lol. Tisa important to Q n A n K plus Knowing astounds and also creates Mytyres to find or create crosses four. Thank you for your ability to withstand through the thick & the thin of it, and understand better than most.